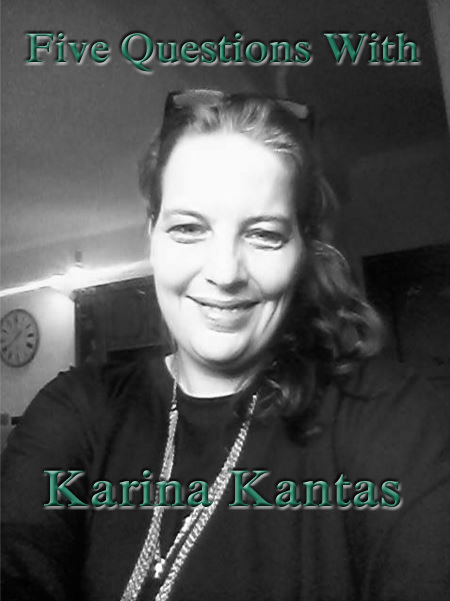 Answering my questions today is Karina Kantas, author of several novels and short story collections spanning various genres. Welcome Karina! Why did you start writing? I started writing because I had a story to tell and the characters wouldn’t shut up until I did. What’s your favorite thing about being an author? When a total stranger gets in touch to say how much they enjoyed the book. How they could relate to it and how they got some closure from reading the book. And it’s always nice to receive surprise ratings and reviews. Have you read anything fantastic lately? Two books by Indie authors. Kissing the Rain, a paranormal romance by Jen Winters. Halloween Trickery, a collection of three short stories by Barbara Chioffi. What can readers expect from your books? Titles to date: In Times of Violence – YA Urban thriller/romance, Huntress – MC thriller/romance, Lawless Justice – Vigilante thriller, Stone Cold – YA Supernatural thriller, Heads & Tales – A collection of flash fiction of all genres, Undressed – A collection of poetry, prose flash fiction and excerpts. Anything new you’d like to share? As well as an author I am also a narrator, VA and freelance writer. This section features interviews with writerly friends, many from the Goodreads group Read Romance, Write Romance.